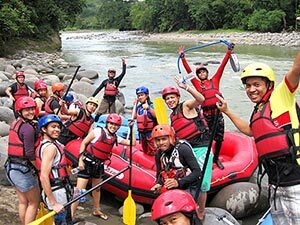 There are few adventure travel experiences that compare to white water rafting and Davao offers arguably the best, year-round rafting opportunity in Asia. 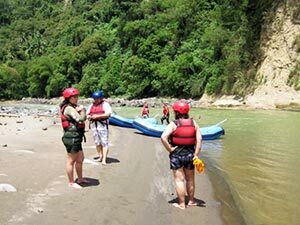 The Davao river rafting adventure takes most of a day and will stimulate all of your senses. It will give you so much to post on Facebook, YouTube et al that you will want to invite all of your friends to join you on your next Davao travel adventure. Less than one hour West of Davao City, in the foothills of the dramatic mountains that rise above Davao, the clear–water rivers cascade and gush over rapids, apparently made especially for your own group adventure. Safety First: the start of the white water adventure is along a quiet stretch of water where you will be taught to float in the river and get back aboard the rubber boat. Travel–Davao will take you on this adventure and make sure you have everything you need, you need to bring very little except some clothes that you don’t mind getting wet. 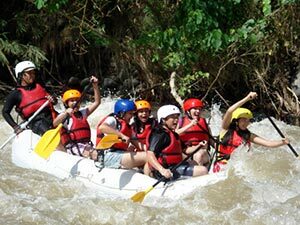 The rafting river is divided into stages to ensure everyone gets the maximum fun and enjoyment. In each stage there are special highlights, and videos are taken from the river bank so that you can take home something to share from your adventure. So long as the river is at a safe level, all adventures start where you kiss the wall . . . and from there on it is a wild river ride until the boats come to shore. Watch the Kiss The Wall video now! Along the river you will get to see river & forest birds and other animals. The half–way lunch stop will give you time for a quite swim or a relaxing stretch on the sand, in the shade of some ancient trees. Note: river rafting does not require that you know how to swim as floatation devices are provided. Whether you have been on white water before or not, you will find more fun on the rivers above Davao City than anywhere else you have been. 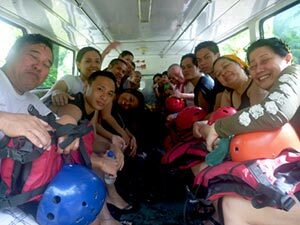 The Davao Rafting tour package takes the best part of a day. Travel–Davao make sure you get to the starting point on time and make sure you get safely back to you hotel / resort in Davao City. You will need to bring a set of clothes that you do not mind to get wet and you might choose not to bring cameras and mobile phones, unless they are waterproof - despite what Globe, Smart and Sun tell you in the advertisements, their networks do not have nationwide coverage and especially not on/near the river. At the end of your Travel–Davao adventure you will receive a record of your experience in digital form - both video and still images. 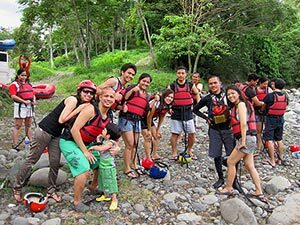 Davao rafting tour packages include: the transport from Davao City, to and from the rafting area; rental of safety equipment, such as personal floatation devices and helmets; hiring of the rubber boats & the experienced rafting guides; and, food & plenty of water. Accommodation is also provided at the hotel / lodging of your choice. 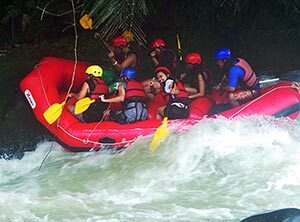 Each rafting boat can carry from four to ten passengers and complete with paddles for all.